Recent helicopter surveys of bald eagle nests in the eastern half of Georgia underscored the iconic raptor’s resurgence in the state – and in more ways than one. 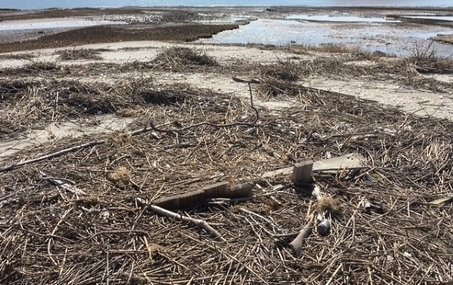 Nearly 110 occupied nesting territories were found in the six coastal counties and an area roughly from the South Carolina state line to interstates 16 and 85. Those nests fledged an estimated 127 young. But after three straight years of 200-plus nests statewide – including a record 218 last year – DNR’s Dr. Bob Sargent also scaled back surveys. Instead of flying most of the state each year, he’s checking half. The change syncs with the raptor’s range-wide comeback while continuing standardized monitoring and mirroring slimmed-down eagle counts in neighboring states. It also frees money for other needed conservation projects. One was a search for peregrine falcon nests in north Georgia last month. What the switch doesn’t signal is that conserving eagles is any less important, according to Sargent, a program manager with DNR’s Nongame Conservation Section. Bald eagles are state-listed as threatened and a high-priority species in Georgia's State Wildlife Action Plan, a guiding conservation strategy. DNR tracks eagle nesting through aerial surveys in January and again in March and April. Some nests in areas not checked by air are monitored by staff and volunteers. While the 2018 survey covered from the coast to northeast Georgia, Sargent also checked nearly half of northwest Georgia’s known nests during a flight in April to look for peregrine falcon eyries. 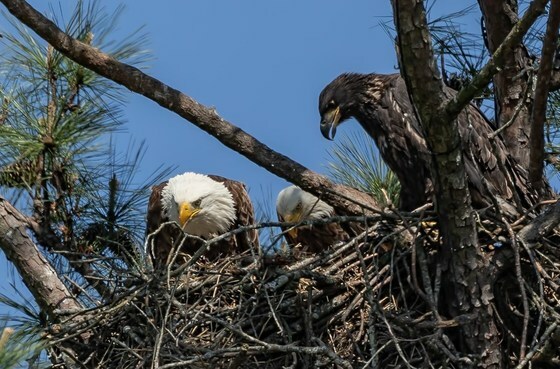 Six coastal counties (including barrier islands): 79 occupied nest territories, with 64 fledging at least one eaglet (81 percent success rate) and 95 young fledged (1.2 per occupied territory). Eastern area (I-16 to the south, I-85 to the north and west, and the Savannah River to the east and northeast, excluding Savannah): 28 occupied nest territories, with 19 fledging at least one eaglet (68 percent success rate) and 32 young fledged (1.1 per occupied territory). 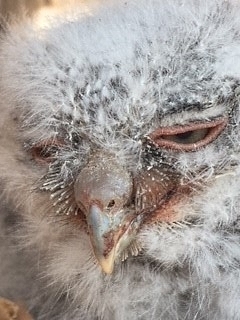 Totals (including data from volunteer and staff monitors): 123 occupied nest territories, with 97 fledging at least one eaglet (79 percent success rate – which is on the upper end of the average long-term range) and 147 young fledged (1.2 per occupied territory, the long-term average). Lost and found: Three to four nests were either substantially damaged or destroyed by Hurricane Irma last fall. But 11 new nests were found, including five on the coast. Ground nest: One of the “newcomers” was the first known ground nest of a bald eagle recorded in Georgia (pictured above). It was made in the wrack on Cabbage Island. Unfortunately, the nest failed. The public can report nests online, at (478) 994-1438) or by email. Eagle or osprey nest? They are often confused. Check out the differences. 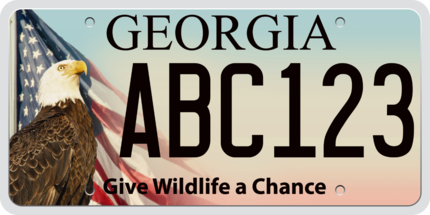 Buy or renew an eagle or hummingbird license plate – only $25 more than a standard tag and most of the fee is dedicated to wildlife. Donate at www.gooutdoorsgeorgia.com. Click “Licenses and Permits” and log in. Learn more. How is your money put to work for wildlife? Details here. 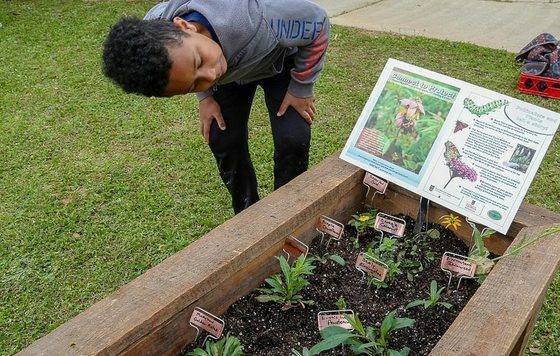 An effort to raise awareness of the crucial role native plants play in healthy ecosystems has taken root in another county school system, thanks to some teen-aged ambassadors. As a junior in 2017 at Oconee County High in Watkinsville, Harper Ann Moffett became interested in Connect to Protect. The State Botanical Garden of Georgia program combines native plant displays with signs, brochures and other outreach to stress how plants support wildlife throughout the food web, from monarchs to mammals. Moffett, daughter of DNR botanist Dr. J. Mincy Moffett Jr., installed a Connect to Protect planter at an Oconee elementary school. “I was looking for a good experience, and since my dad is a botanist, plants have been a big part of my life,” she told a local reporter. This past school year, Moffett pitched the idea to fellow Environmental Club members at school. 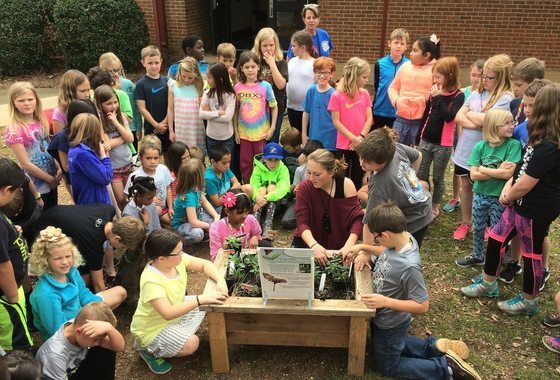 The club ran with it, building three planters with recycled wood and donated hardware, installing two at other Oconee elementaries (at no cost to the schools) and explaining to younger students the ties that bind plants and animals. The environment and the students – young and old – benefited, suggested science teacher and club sponsor Amy Asman. “Me being a teacher, it was great seeing my students teach others." For rising senior Sofia Franzluebbers, the schoolchildren’s excitement and eagerness to help were encouraging. Like Moffett’s, her family has deep roots in botany. Her parents have doctorates in soil science and Franzluebbers grew up helping tend gardens, fascinated with how plants grow. "It was great to see others as interested in plants,” she said. Fostering that interest statewide is Connect to Protect’s goal, said coordinator Heather Alley, conservation horticulturist at the State Botanical Garden in Athens. Planters are only a starting point. “The hope is that if enough people learn about the importance of native plants, and planting these plants in their landscape, then together we can have a significant impact,” Alley said. The program is growing. About 30 planters and gardens have been created. One is planned as far south as Moultrie. A soon-coming update to the initiative’s popular coloring book will emphasize pollinator ties to food crops. And this fall, along with collecting recyclables and composting lunchroom leftovers, the Oconee County High Environmental Club will decide where to put that third planter, and how to nurture the club's continuing role in Connect to Protect. The State Botanical Garden can help customize a garden for your site. Learn more. Georgia and Alabama may take different sides on the field, but each state’s Bat Working Group will team up in the field for a Bat Blitz May 29-June 1. Researchers at the event, based this year at Lake Point State Park in Eufaula, Ala., will be collecting data on local bat populations. The information can help improve monitoring and management. But each blitz also features opportunities for the public to learn about bats. 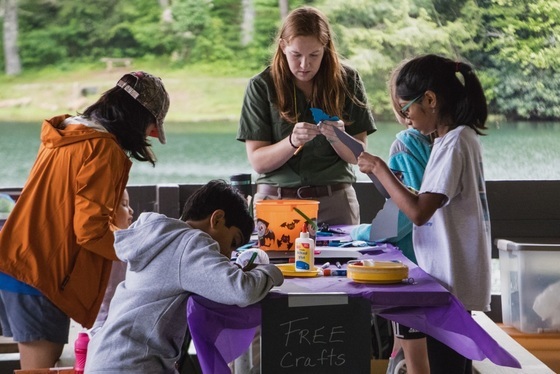 A lineup of activities from 2-10 p.m. May 31 varies from live bat presentations to bat-house building, art contest awards (enter by May 25) and, for those preregistered and 10 or older, a mist-netting demo. Events schedule. 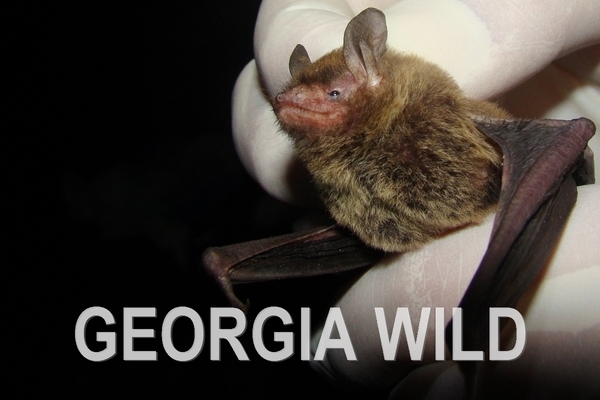 In addition to the Georgia and Alabama bat working groups, blitzers will include both states’ DNRs, Auburn University’s Museum of Natural History, Birmingham Zoo, the University of Georgia’s Museum of Natural History, A-Z Animals, the U.S. Forest Service, Huntsville Bat House Project and Habitat for Bats. Sea turtle nesting is in full swing on Georgia barrier islands. Track nest -- and later this summer, hatching -- results by beach at seaturtle.org. Sea turtle strandings briefly surged above-average in early May, increasing the number of turtles found injured or dead this year along the state’s coast to 59. Boaters, be on the lookout: boat collisions were the cause of death in at least three recent strandings. Report strandings: 800-2-SAVE-Me (800-272-8363). Updates. Snake-related calls and emails to DNR senior wildlife biologist John Jensen also surge as the weather warms. Most often asked: What species is this and what do I do with it? Check out Jensen’s answers. 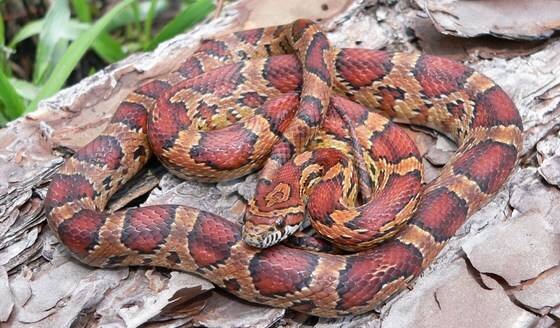 More on Georgia snakes. The plastic “plague” drawing attention from National Geographic’s June cover story cropped up this month in Georgia. The necropsy of a pygmy sperm whale that stranded on Sapelo Island revealed plastic in the whale’s stomach. Whales vs. plastic debris. Red-cockaded woodpeckers are keeping Nongame Conservation Section’s Joe Burnam and Zach Henshaw busy. The two are monitoring nests of the endangered birds from Silver Lake Wildlife Management Area near Bainbridge to Moody Forest WMA near Baxley, and they've banded more than 40 young so far. Southeastern American kestrels are doing the same for nongame’s Ashley Harrington in middle Georgia. He has documented at least 14 active nests for the mini-falcons at Sandhills Wildlife Management Area in Taylor County, plus one for eastern screech owls (owlet at right). A bald eagle hit by a car near Macon on May 13 didn’t make it. Though immediately tended by motorists and taken by DNR to Auburn University’s Southeastern Raptor Center, the injuries were too extensive and the bird was euthanized. Recovering America's Wildlife Act has the support of the Southeastern Association of Fish and Wildlife Agencies. The association's board recently backed the bipartisan federal legislation to redirect $1.3 billion collected from oil, gas and mineral royalties to states to fully implement their wildlife action plans and conserve at-risk species. New markers installed along the sand ridge nature trail at Big Hammock Wildlife Management finished trail upgrades at the WMA near Glennville. The work funded by a grant from The Environmental Resources Network, Nongame Conservation Section’s friends group, included markers designed and built by WWF Metal Fabrication and Welding in Athens, kiosk repairs, and an updated trail guide. Names in the news: Charlie Elliott Wildlife Center’s new residential program coordinator is Katie McCollum. Her work experience varies from leading educational programs at the State Botanical Garden of Georgia, Lincoln Children’s Zoo and Charlie Elliott to researching kori bustards and helmeted guineafowl in Botswana. DNR’s Dr. Mincy J. Moffett Jr., John Thrift and Marylou Moore and The Nature Conservancy’s Malcolm Hodges guided a field class at Ohoopee Dunes Wildlife Management Area for 250 Swainsboro Middle School seventh-graders. The interpretive stations and two-mile hike focused on riverine sandhill ecology, biology and conservation. The Pi-ed-billed Grebes recently donated $1,293 to Trees Atlanta. The conservation contribution was raised by the Paideia School’s two teams in the Youth Birding Competition. DNR botanist Tom Patrick led three trips to see bog and sandhill flora at Sandhills West WMA and a Nature Conservancy tract as part of the Georgia Botanical Society’s annual spring wildflower pilgrimage. Fellow botanist Lisa Kruse was the point person on a Botanical Society hike at Woodlands Garden in Decatur and – for the wildflower pilgrimage – a walk on Big Lazer WMA. 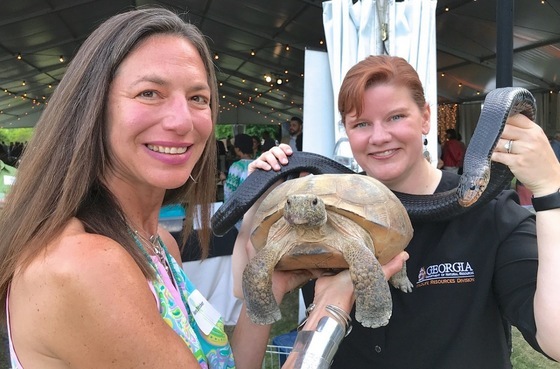 Linda May, Nongame Conservation's environmental outreach coordinator, introduced guests to native wildlife including an eastern indigo snake and a gopher tortoise at The Nature Conservancy’s Moonlight through the Pines event May 4 at Piedmont Park. May 26 – Bird banding, 5:15 a.m. Panola Mountain State Park, Stockbridge. Other dates include: 5:15 a.m. June 7 and 22. Details: Georgia Important Bird Areas Program Coordinator Charlie Muise. "Shorebirds wing it to Georgia coast," The Brunswick News. 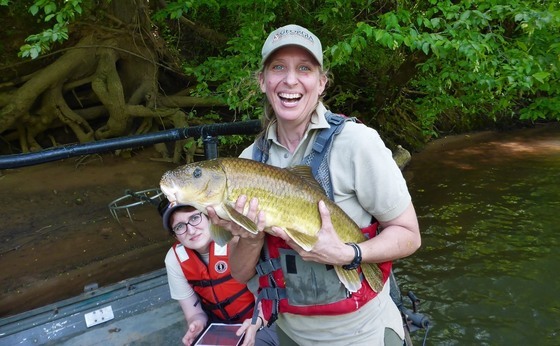 Also: "Bird conservators flock together to celebrate coast"
Awesome Ocmulgee find: DNR’s Paula Marcinek, Peter Dimmick and Kathleen Quebedeaux caught, tagged and released four robust redhorse suckers on the river near Juliette May 4. The three females and one male were all adults in spawning condition. The fish also marked the first sighting of this state-endangered species in the Altamaha River drainage in more than three years. Robust redhorse are managed by the Robust Redhorse Conservation Committee and monitored through a State Wildlife Grant awarded Georgia, South Carolina and North Carolina.